It's relatively peaceful here, up around Kirkland in the Twilight Highlands. Good hunting grounds between our small town, the coast to the east, then south to the point near the Horde encampment that's just off shore. Plenty of worgs, elk and owls. Seldom, if ever, any enemy Horde to contend with. Yessir, a great place to just hunt and skin. Peaceful enough to let your mind wander over the day's events and battlegrounds. A couple of mountain ridges and valleys which block out the scattered fires, warring factions and just plain weird monsters. 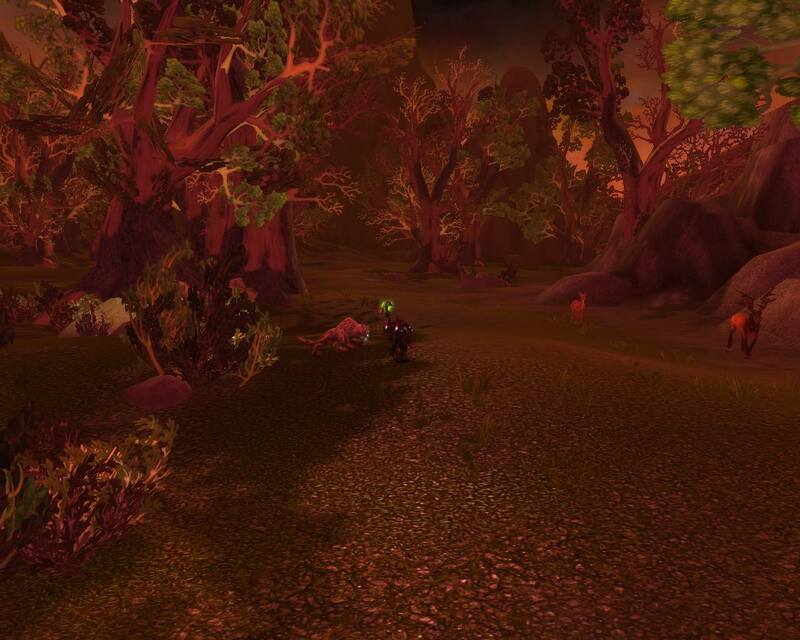 Yep, a good place for this dwarven hunter to wander, hunt, and generally un-wind. One lazy mindless hour here and 3-4 stacks of savage leather will be added to the storehouse. All is good. Late this afternoon though, my little peaceful hunting trek was broken. The sky suddenly turned an eerie color of deep red/orange and visibility dropped considerablely. I knew the signs immediately. After all, I am a beast master hunter who can track and kill even the most elusive of beasts. But this one is special, a real monster. "Sky Gone Red" means only one thing. And that is the impending appearance of Deathwing himself. Yep, you guessed it. As soon as I broke through the haze into Deathwings' calling card....instant combustion. I could hear the announcement while falling from the skies, "On today's menu we have a generous helping of Blackened Dwarf. Freshly fired, which will be served as soon as some extra tenderizing is completed by allowing it to free-fall upon jagged coastal rocks." Being the astute hunter/historian beast master that I am, I allowed my spirit-corpse to scan the skies for sight of the monster that preformed this most horribus act upon my physical body. Nowhere in sight. Not even a small parting glimpse. I lay upon those jagged coastal rocks, heartbroken, burnt to a crisp. As I comtemplated my current state, still scanning the skies somewhat in vain, my spirit eyes rested upon the most beautiful, heart-warming sight I ever did see. Behold!!! There was the Horde encampment, totally engulfed in flames. Burning brightly, no doubt completely littered with blackened Horde. Such a wonderous sight. I just had to allow my spirit to bask in it for a bit longer. I'm sure many have had their run-in with Deathwing by now. 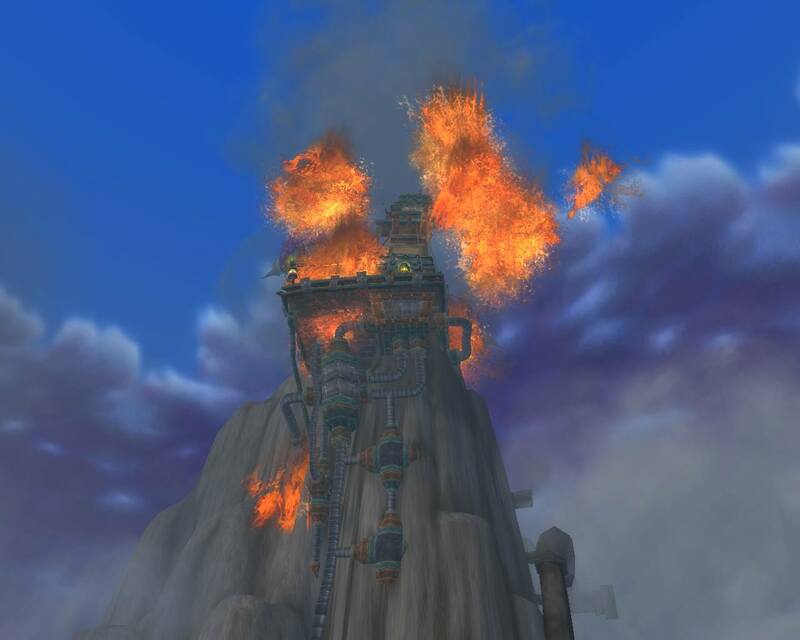 Were you as excited about the end result as Khrox was viewing a blazing Horde Camp? Oh Khrox you lucky dwarf! I'll have to be content to be excited for him. My main still has never seen the sky turn red. Obviously, Deathwing is still making his rounds through Azeroth, although I did think of them as rare for some time. Good luck to you! Hopefully you'll actually get to see him.